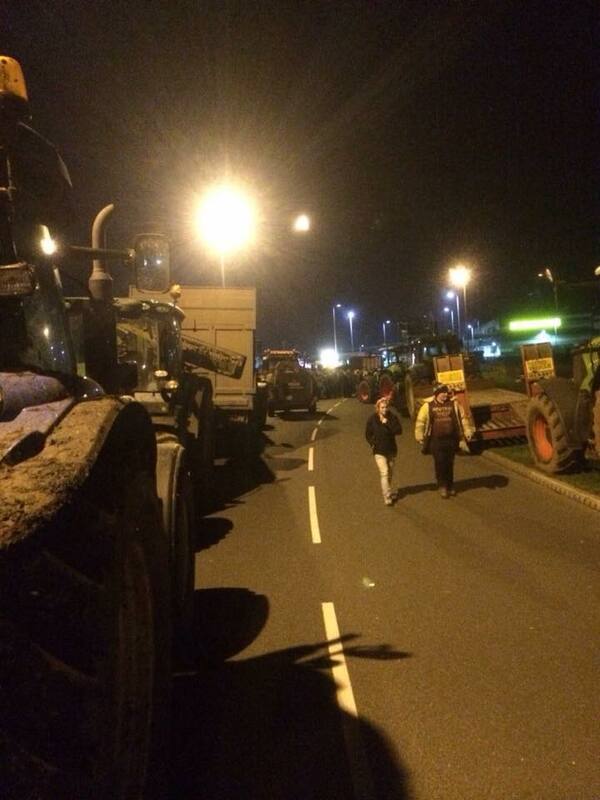 ROAD BLOCK: A line of tractors line up on the road up to the Morrison’s supermarket distribution centre in Bridgwater. Picture by Marilyn Handley. 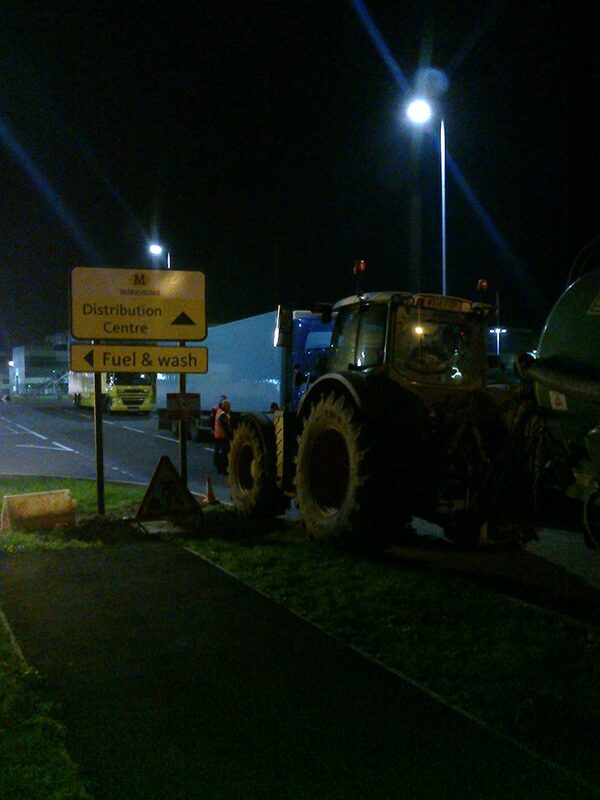 STRAIGHT AHEAD: One tractor stops temporarily at the cross roads towards the Morrisons distribution centre at Bridgwater. Picture by Dennis Jones. 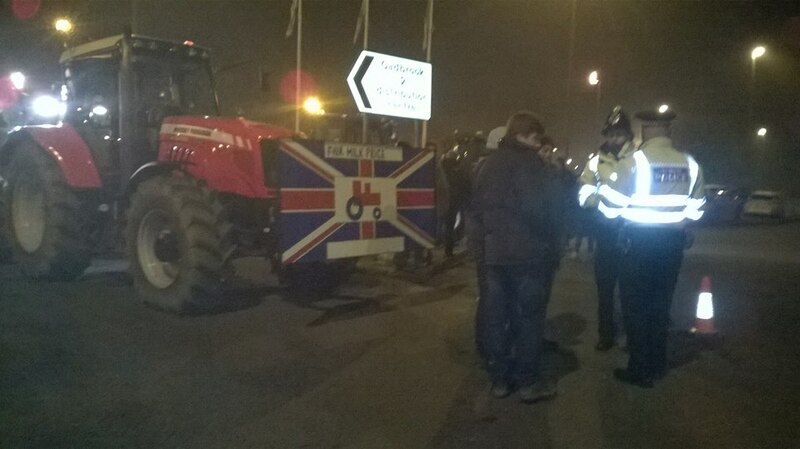 PEACEFUL PROTEST: Farmers For Action protesters talk with police officers outside Morrison’s distribution centre. Picture by Jane Charlesworth. SOMERSET and Dorset dairy farmers and other regional colleagues have brought their protests to a major retailer’s distribution centre. Apart from some news bulletins in regional television and radio bulletins and the industry’s media, there should have been more media attention given to this threat to food security. So in my limited reach, those of you who do need to know what is going on and also realise the consequences of not buying local milk and dairy products when and where you can as it effects not just the dairy guys but hauliers, livestock auctioneers, milk processors, cheese factories and the way the countryside looks and the wider rural economy. It’s not something that can be disputed, it is a fact. How do I know? I studied Rural Resource Management at agricultural college, including the rural economy in depth and have lived in a Somerset village for 10 years. Genuine farmers and conservationists work together for the benefit of the countryside and its protection, not against each other as some would have you believe. This is something I shared on my Facebook page, Dorset and Somerset Community Watch by Anna Kostanian Art in relation to Christmas. Although this statement I am referring to does not directly refer to small and medium-sized dairy farmers who graze our countryside, but this post is speaking for them too. It reads: “Here’s an idea. Let’s buy Christmas presents from small local businesses and self-employed people, for example. From your neighbour who sells on-line, from a local craftsperson who makes jewelry, the stunning local florists’ shop, the local bakers that makes home-made buns, cakes and chocolates. This is a different form of journalism to what I’m used to, so I am just going to quote some of the guys who were at the Morrison’s distribution centre at Bridgwater, who just want to receive a price for their milk above the cost of production. Here are some things to ponder if they are not here to supply the raw material. Firstly this is part of a letter sent to the National Farmers Union by Morrisons on milk prices: “We are therefore really concerned about the impact on dairy farmers suffering from recent price cuts and particularly so for those farmers who have invested heavily in their businesses. “The degree of price volatility we have seen in dairy is not helpful for any business, and the recent movements in global dairy commodity prices have been unparalleled. World milk powder prices fell by 11% last month — an unprecedented drop. “Therefore, new mechanisms to help the industry cope with this level of price movement must be developed. We at Morrisons are committed to doing this and are well advanced, as evidenced by our cheese contract which the NFU welcomed last year. “We are re-tendering for liquid milk supplies because we are coming to the end of our current five-year contract in 2015, not in response to the current market situation. I don’t claim to be an expert in this debate writing about it. Yes, there are factors like global dairy commodity prices but surely giving a guaranteed temporary price is part of the solution for food security and as said before, the threats of ISIS and the Ebola virus are beyond Government control. Somerset dairy farmer Dennis Jones is even more forthright. To highlight the anger felt by many across the industry about seems to be some public apathy towards food security, Michael Salisbury has made the controversial suggestion of producers from all sectors withholding their produce for a period of time. He said: “The UK have some of the toughest animal welfare regulations. To go by what other countries pay including the EU is wrong. “I would love to see all British farmers dump there milk for a day; not send any meat for slaughter and for a day not send wheat to make bread. “You would then see the price in the supermarket rocket as people worry they will not have their milk and toast in the morning. The country needs to back each other and help stop cheap imports. How can New Zealand lamb from a cross the other side of world be cheaper. “And why introduce fair trade in 3rd world countries when it was the supermarkets who were ripping them of to make large profits. It is funny how fair trade was their idea they will stop at nothing to make a profit. Riverford and Able and Cole supply organic milk as well as vegetable boxes. It is labour intensive and is a higher price and goes off more quickly than conventional milk, however it frozen. Good article. Thank you. Basically everyone I buy milk from is ripping off farmers. I thought the co-op agreed 2 years ago to pay a fair price, I see this is not the case. Who should I buy milk from, that’s the question. Well the corner shop pay more? Should it be the milkman? I’m still unsure. I live in Wales and only but low volumes, but I’d rather not exacerbate the problem.